Anthem Red formed from the smoldering ashes of Winnipeg hard-pop trio Sixty Stories (Smallman Records). In 2004, Jo Snyder (guitar, vocals) and Sarah Sangster (bass, vocals) met up with Jeff Hindy (drums) in the basement of a house where they started a casual project involving a four-track and a personal stereo system. Eventually the band grew to a serious effort: Dictaphones, and eventually a computer. Andrew Fylik joined on guitar in early 2005 and the four-piece released their first E.P. : Anthem Red, Live. It was a live recording. 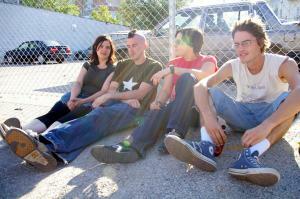 Hindy left the band shortly before the they headed to the studio to record their first full-length, Dancing on the Dishwasher, which came out October 2006. Dustin Karsin (Red Blanket) accompanied the band behind the kit on their first European tour in December 2006 and charmed them so torturously he joined the band permanently in January 2007.